I have seen some big telescopes. Hale, KECK, the LICK refractor, the SHANE reflector, a 16″ Meade living in my friend’s backyard, a 10″ SCT that I used to own, and the 10″ that I ground from a plate that I shared with people on the sidewalks of San Francisco. traveling to telescopes is always an effort. telescopes are far from civilization or from parking on the corner were everyone is setting up. meaning you drop off the Dob then go park or plan ahead to get a ride to top of the mountain. don’t forget your jacket, it will be cold. the problem with telescopes is you want to see them in action but you cannot because they are doing work at night. and they cannot be used by just anybody. unless you are a research scientist, an active journalist, or know somebody you won’t get to see the telescope with the doors open. that’s not to say you won’t have an interesting trip to the top of a mountain. like going to see Palomar. it takes all day to get there and once you get there nothing is open. not even the gift shop although sometimes it is. but it is impressive just the see it. to think how important the telescope was to people to build a road, carry all the materials to the top, then construct building for the biggest bigger instrument at great expense. 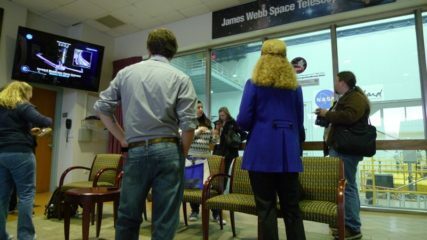 the gift of seeing the James Webb Space Telescope got canceled because of snow. the mammoth storm took out Washington DC for nearly a week. 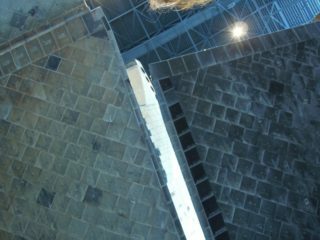 the tour was to include seeing one of the last two mirrors get installed on in the grid of mirrors. and despite the snow and the crushing weather those two mirrors got installed on time. thus, the people invited to the NASA Social did not get to see that task. the event was on the web cam. which was cool to see in consolation. as I live in San Francisco I wanted to maximize the trip to see as much SPACE as possible. 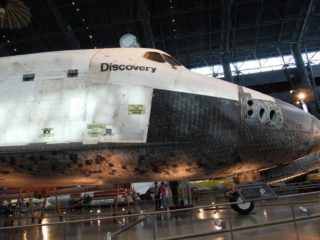 I booked some extra days in front of the rescheduled tour allowing me to see the Shuttle, X1, and the LEM. that was the plan. 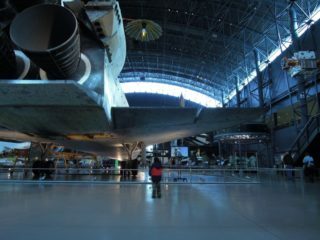 the space shuttle is the last of the Von Braun era of space craft. it came with a wild sales pitch that made the claim of reusability, quick turn around, and cost effective flight. it is only when you stand underneath the behemoth that you realize that this plan was crazy. 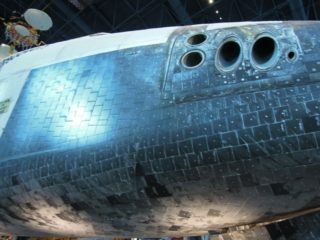 it was said that the shuttle was the most complicated machine ever made. maybe. I would venture that an A380 or Astute class submarine is just as complex. 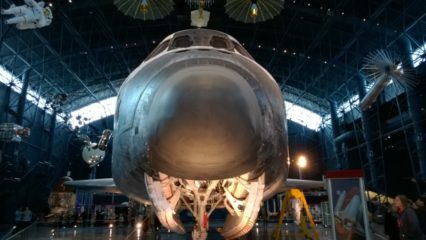 given that either has to maintain continuous use compared to the short but violent time the shuttle was in operation for a mission. standing under Discover I think, “this was crazy. why wasn’t this stopped before it got this far?” this is in my mind because the ship is big. it seems nuts to carry such a large object into orbit when every gram of weight has a cost. I wonder about the payloads that could have been if the carrier was different. did it have to have wings? 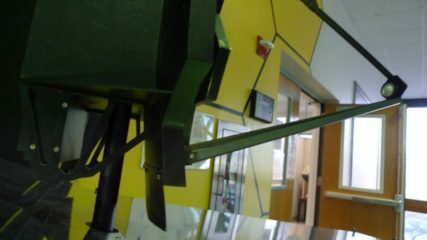 why not leave the big parts there to be used for interesting things like living space or a place to make this or that. I sat there wondering about the systems that had to be created from nothing because nothing like them existed before. it is no wonder it cost so much. and it is no wonder it broke. twice. that they did not lose all of them shows how much care they got before, during, and after. the Annex has some room inside. there was lots to see parked under the roof. from an Apollo DSKY to a Pathfinder. 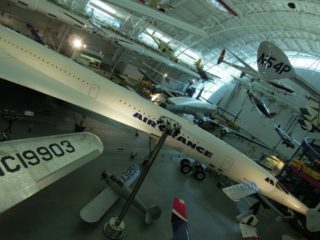 a Concorde to a Goonybird. missiles, rockets, capsules. the Mothership from Close Encounters of the Third Kind. 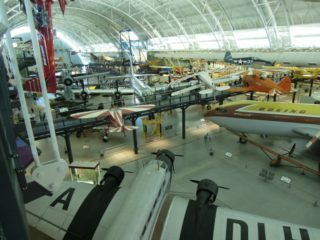 my interest was space this day so after seeing the beyond I quickly walked through the aviation artifacts, had some lunch, then found the gift shop. I escaped with a mission patch via the bus. 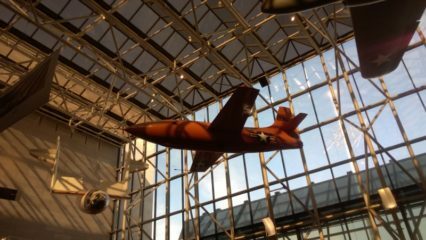 destination next was Air and Space Museum. I have been here before. twice. once when I was 12. and then 5 years later on tour with the youth symphony. I remember a sparkling experience that was full of interesting at every turn. what I found this time was a something that looked old and beat up. there were two things of interest to me for this visit. Hubble and X1. more on those in a bit. the one artifact that amazes me now is the Skylab. 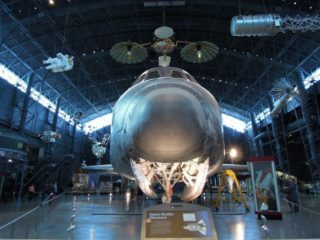 what a travesty that NASA could not find a way to park it so it could be used again. instead, it was allowed to fall back to Erf burning up on the way. mostly. Skylab was HUGE compared to ISS. sigh. maybe if the solar panels had deployed correctly it would have found a longer life. 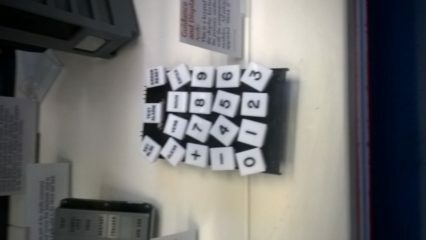 the Apollo display looks old because it is. 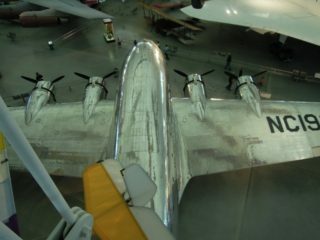 the fabrication looks like World War II era aircraft. the instruments look archaic. 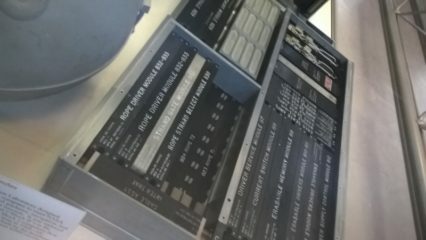 so many switches, knobs, that add to the complexity of a complicated system. no wonder it took 100X more training time compared to flying an actual mission. it’s also not an accident that the guys who were astronauts were military pilots and not scientists. never mind that every scientist held disdain for the mission planners who kept to this as the plan until Jack Schmidt got selected as the first and last scientist to go to Mun. 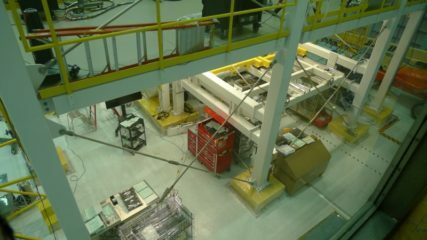 the telescope full scale mockup is standing upright in the corner. when see it on the screen there is really no scale to go by except when an astronaut is floating nearby. and then the scale does not hit home about how big it really is. it’s big. 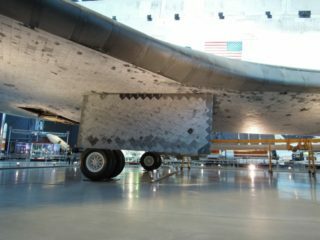 built in 1975 this particular artifact was used to help determine construction feasibility of the actual instrument by testing structure, handling procedures, and was a home fitting and testing of wiring harnesses. 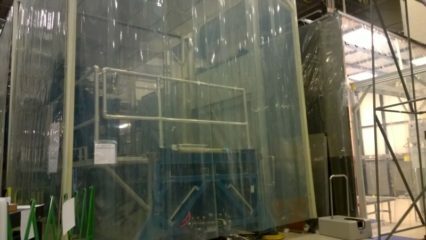 its last roll was vibration and thermal studies. 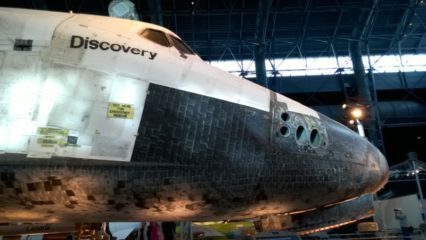 while this version never flew, actual Hubble could not have happened without it. so it’s as real as the real thing. 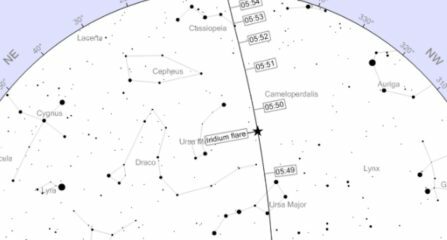 underneath it and nearby are the WFPC2 and COSTAR. the later is the corrective optic that fixed the mirror problem that caused images to be out of focus. 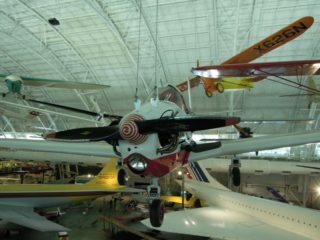 WFPC2 or Wide Field and Planetary Camera 2 was the second camera to fly. WFPC2 was the camera that made the DEEP FIELD image that took nines days aimed at a specific place revealing 1ooo’s of galaxy in a spot that looked completely empty. many say this is one of Hubble’s outstanding achievements. 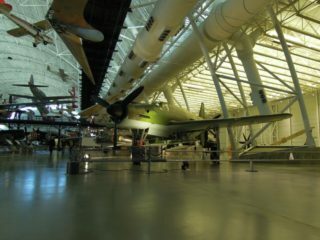 standing under the aircraft that broke the barrier known as the speed of sound reveals how remarkable this aircraft was. is is so simple. it really does look like a bullet with wings. at some point after it was finished flight testing somebody must have gaving it a shiny coat of paint. because it looks like a classic car and not an aircraft with flights that ended up landing on a dirt runway. 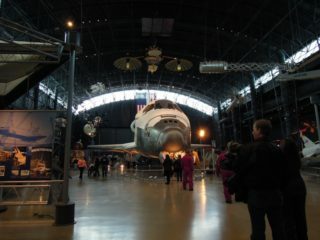 interesting how nearby Space Ship One looks similar in size and shape. 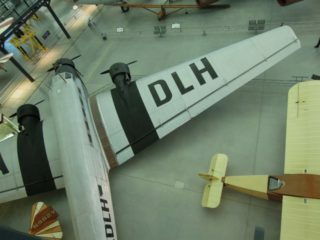 the wing chord is thicker with a shorter overall wingspan. and the visibility with it’s bubble of windows looks to be the the same. one rocket versus four. both burn similar fuel. both land without power. some things never change. it’s big and gangly enough that it cannot easily move out of the building for cleaning. so they are doing it there. all the panels, covers and holders are open. this is as inside baseball, err, engineering as you can get. and wow does it look complicated and simple all at the same time. go see it while it is open. 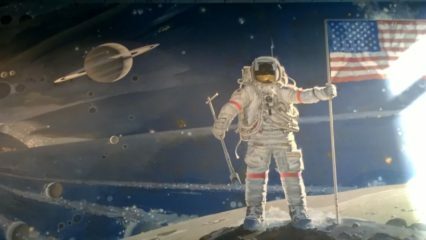 Bob McCall was one of many artists that captured the space program. McCall might be the most famous of the painters because of his particular photo real qualities without sacrificing the wonder of the place. yes, I have a a book with these paintings. but seeing the mural, the one that takes up the whole wall is so impressive. there is so much history here. but there is also a lot of history missing. it’s too bad there SpaceX does not have pieces on display. ATX is missing. Blue Origin should have a place. and even Armadillo Space, the scrappy project that DOOM creator John Carmack funded, should be in a display case if only for inspiration. where is LCARRS? where is LADEE? where is Curiosity, Opportuntiy, and Progress? what about Viking? I get it… money. a display has a cost. but you and I have already paid for these artifacts. we should get to see them. the weather was in question. again. there was a possibility that the day was going to get canceled. again. “we will know by 10AM” was the word that came via email. 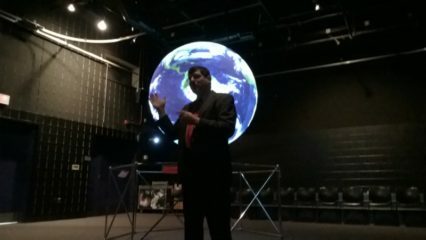 knowing the time when the Future of NASA talk was supposed to happen I decided that I should make my way to Greenwood with the idea that the day was going to happen. and if it did not, I would just go home. the bus dropped me off in front of the visitor center. and inside I was informed that the day had been canceled.except that it had not been off’d officially. it was on stand by. and we would know soon. I was there so I looked around. in this case being early had uncovered a artifact that nearly nobody else noticed. seeing this was almost better than seeing the real thing. I could touch it. see it up close. and I had all the time to do that with nobody watching over me. 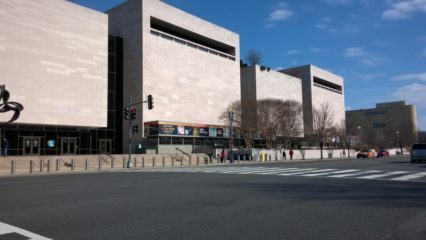 NEVER pass over a visitor center because it looks like noting is there. 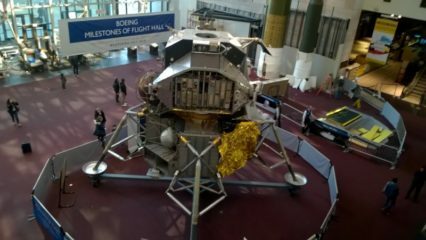 I found moon rocks, test gear, satellite mock ups, and something that looked too good to be there. 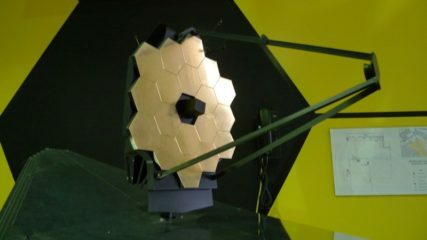 the JWST mirror display held a FAKE’d mirror that was the zact size of any of the real mirrors. the gold coating on substate looked like it came from Auto Center ready for your window tinting project. 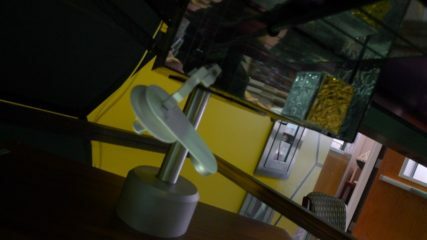 on further examination it appeared that the metal holding the fake mirror was something that should not be here. it looked precisely machined. it turns out it was exactly what I though it was… it was metal that had been made for doing qualifications. it likely had an assigned value of $200K. and there might have been 18 of them as part of the road to make them perfect. as precise as it was it looked like it was not quite done. I bet somebody tested the shavings that came off the CNC surface as the mount was cut. this stuff is usually destroyed, stored, or reused for further testing. 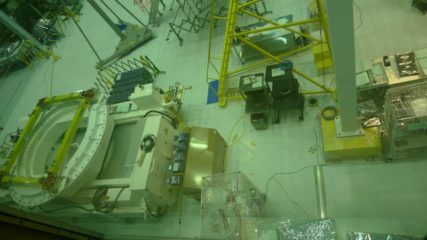 yet here it was. .
after examining them mirror mount to my own personal satisfaction I went over to the Gemini mockup, a left over from when the visitors center was first installed. this thing needs help to be interesting. the switches were busted. the screen was torn. and there was no explanation. this might be exciting if you were four. I doubly doubt it. somebody should make it do missions: Agena rendezvous, Gemini + Gemini fly by, and re-entry burn to parachutes. next to the capsule where two very interesting space artifacts. 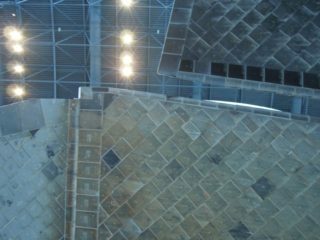 both were used on the LAST Hubble repair / upgrade. 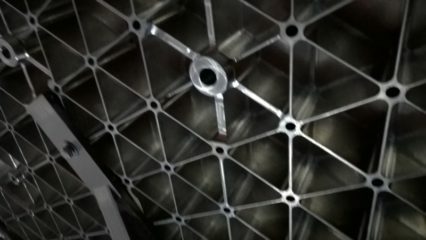 the plexiglass screw capture plate that went up against the bulkhead allowing astronauts to remove the plate to get access to the inside without losing a single screw. the system was ingeneous. 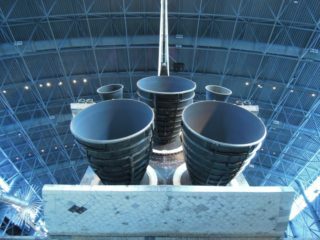 it acted as a todo, guide, work load reduction and safety to the space craft. the hole for the automatic screw driver were color and size coded insuring the unscrewing could not go wrong. there was a bunch of intro as part of day. 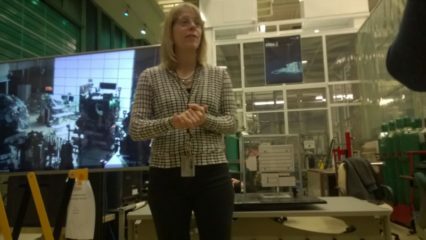 we got to hear the Director of Goddard talk about what goes on at the facility. lots. how much it costs. lots. and how many people it takes. not as many as lots. 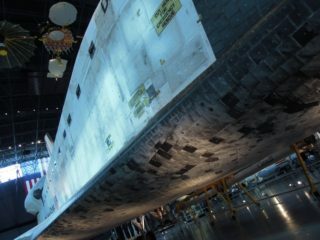 space has a budget that feeds science. 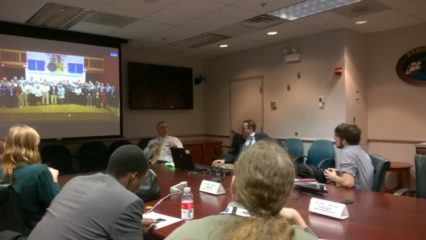 after watching the video feed of Charlie Bolden on the State of NASA we heard from Christopher Scolese again about the actual budget that would drive projects at Goddard. the BIG line item that is missing is Shuttle flights. but lots of this budget is replaced with SLS. go figure. 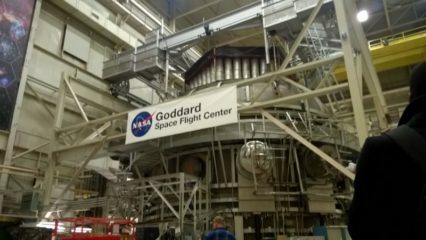 and even with that money going onward to other places Goddard is flying something like 60 missions in the next 4 years. you can watch the Bolden speech here. I’m not sure what to make of it. there is not much substance. it’s a rah, rah! GO NASA kind of thing. TESS is the next version of Kepler. inspired by the successes of the last planet finding telescope the next version is more ambitious and clever. as missions go, TESS is cheap because of the clever. 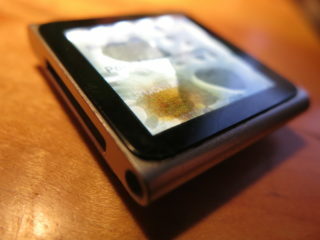 it uses as much off the shelf parts as possible from battery, power supply, solar cells, and support electronics. 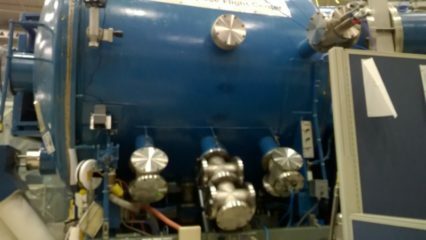 nothing here is new except for the camera and CCDs used to capture star light. the battle of the project is with the budget. if the telescope needs more power then a different part has to be purchased, tested, and implemented within what the program has to defined. once the path is set, it is not simple to just swap a part to attain the goal. it does not work that way. unlike returning parts to the Silicon Valley Hardware Lending Library parts for space craft cannot be returned. space is a horrible for things. there is extremes from temperature to radiation that affect everything about device. 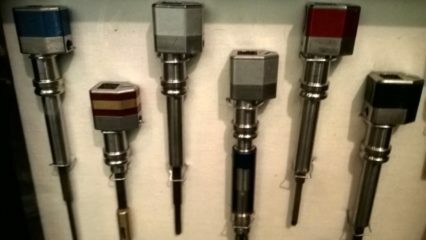 even vacuum which you would image wold protects things can be a problem as the reaction of parts from how they are made to how they reacted to the environment. 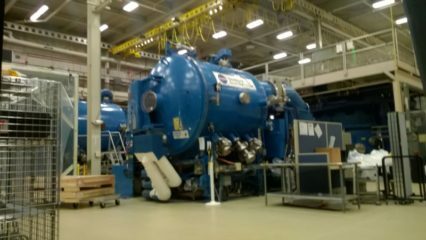 the LAB where all the testing is done at Goddard has it covered from vibration to the cold of space. all the machines are big and old and get used to prove these vehicles are ready for the missions. by the time a machine gets out of there it will perform as well as expected until it does not. after leaving the big testing area we walked up some stairs in what looked like just another office area. at the top of the stairs was some glass. and there it was. 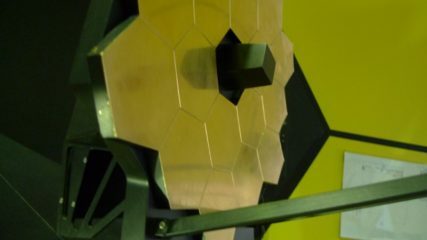 the James Webb Space Telescope. 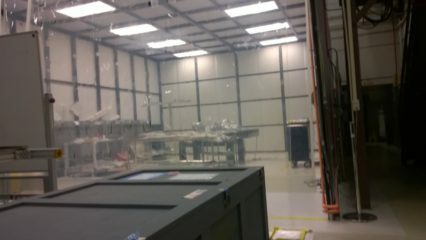 there were were people in the clean room. doing whatever they were doing. 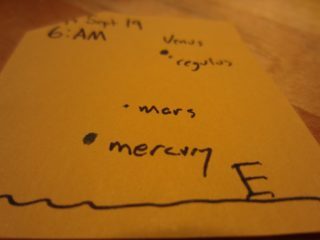 and there was the telescope. all the mirrors were covered over with black. and that was that. 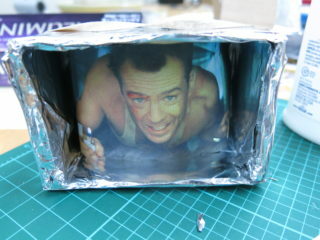 the room had a model that somebody had made. and there were full size mirrors on the wall so we could get an idea of the size. 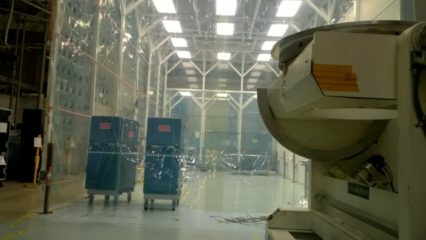 interesting to me are the things in the clean room. the tool boxes (that look like the boxes in my lab). the desks (my desk is cooler). computers, keyboards, monitors (everyone shops at the Silicon Valley Hardware Lending Library). all the things you need. I wonder what the procedure is for bringing in an item. how is it prepared. what specs are required to allow it in the first place. clearly it cannot be just any adjustable wrench from Home Labyrinth. the last stop was Hubble. 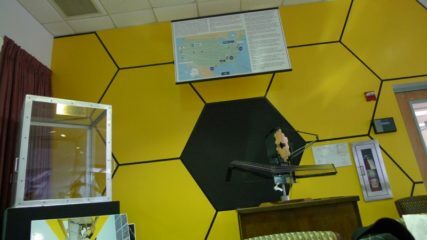 the actual Mission Control for the actual space telescope. these rooms sat behind a door that looked like any other door. inside was was a hallway. there were offices. a few display cases. 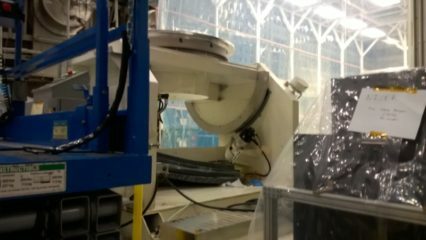 and behind some glass was the controls for the telescope. everyone asks, “can you control it from home from your phone?” no. nope. not. “yes, you COULD control Hubble with such an interface.” was the answer. but it is far too valuable to be left open on an IP address for anyone to harm. Hubble is 25 years old. meaning the control systems for it are advanced for their day but simple by the standards of today. maybe there is a better way to make the system point. but this in not the point. longevity based on simplicity is what makes it go. the protocols that were defined 30 years ago are the very ones in use today. X, Y, Z around constantly moving curved plane. sounds like MATH you only want to figure out once. 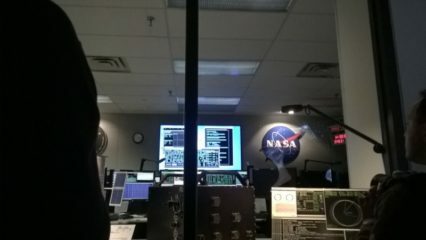 next to Mission Control is an area that simulates Mission Control. this is where ANY and ALL upgrades would get tried out. 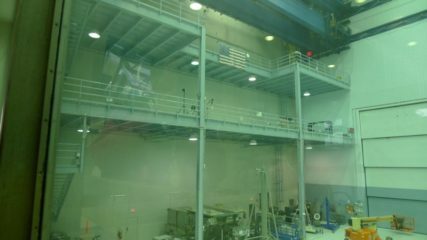 the same room is used for training. it was recently upgraded from the old ASCII terminals to more modern LCD based workstations. but even though the display is new the look of the system is still very much that 80×24 CRT from all those years ago. 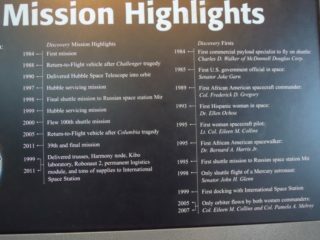 because Hubble has been serviced 4 times over it’s life there are artifacts of these missions on display. old things that did real science returned to Erf as trophies.. there were gyros, sensors, test plates, cameras, and even screw plates that were used to during Mission 4 to capturing every screw. every single one. they counted them to be sure. all of this was unreal to me. 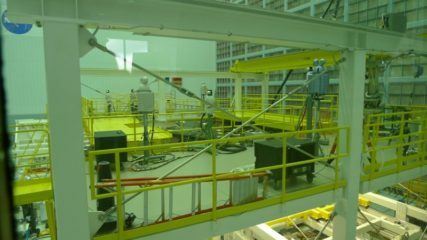 the LAST demo of the day was to see Hubble tools up close. there were two demo tables. one held the very heavy torque screw driver. 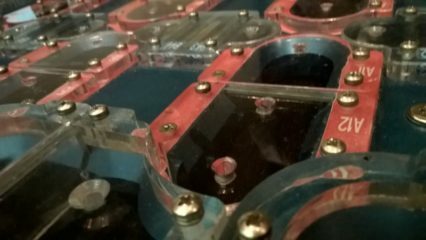 the was for the screw panel catcher plate. the screwdriver was complicated. it needed to be calibrated. and it had battery issues. typical of any automated screw driver. 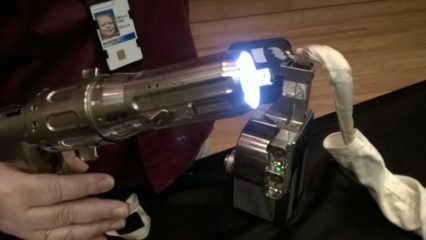 that the astronaut has to use this device with restrictive gloves makes the building the tool for the task even more inspired. that it happens 200 miles above the Erf, in a vacuum, in SPACE is all that more remarkable. this took a team of people doing this for years as their job to make perfect. screw catcher plate seemed even less cool to see in person. 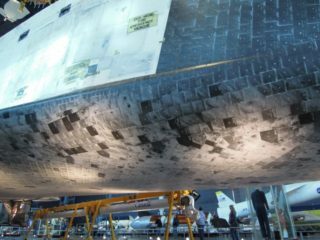 the story about this when it was brought back from the Hubble upgrade mission everyone was very excited to count the screws held inside. they found the exact number they expected. the end of the day was here. I got a ride back to a train. had some food. then packed for the trip home.